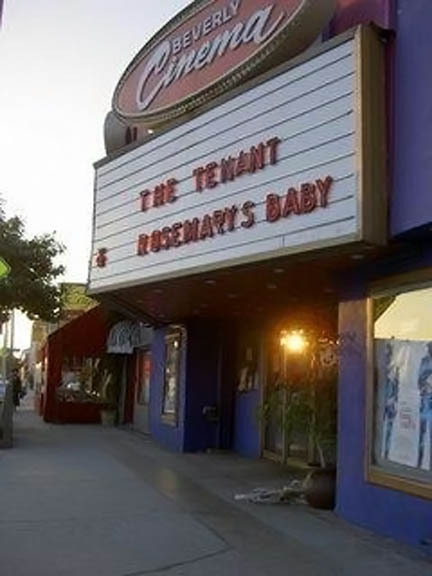 Sherman Torgan, 63, the owner and operator of my old neighborhood repertory movie house, the New Beverly Cinema, died of a heart attack while bike riding in Santa Monica. The New Beverly, on Beverly Blvd. between Formosa and Detroit, was the source of many happy movie memories for me, especially during the late 1980s and early 1990s when I lived nearby, at Oakwood and Sierra Bonita. According to the New Beverly's own site, the place was a vaudeville theater and then the original location of Slapsie Maxie's nightclub, where Dean Martin and Jerry Lewis made their West Coast debut. For nine years it was an adult movie theater (The Eros), until Torgan took it over and turned it into a movie-lover's rep house in 1978. Due to the sudden and completely unexpected passing of my dear beloved father Sherman, the New Beverly's programming will be cancelled until further notice. Sherman was my father and my best friend, and his passing has left me and my family completely devastated. He was the main force behind the New Beverly from May 5, 1978 until the present. I simply do not known when I will be able to fill his shoes. My pain and sorrow are truly too much to bear right now. He was still so young and full of life, and was doing what he loved so much, riding his bike on the Santa Monica bike path, when he died. My mom and I are in utter shock. For background and updates, please visit Dennis Cozzalio's Sergio Leone and the Infield Fly Rule.